This article is about travel. For other uses, see tourism (disambiguation) and tourist (disambiguation). Times Square is the hub of the Broadway theater district and a major cultural venue in Midtown Manhattan, New York City. The pedestrianintersection also has one of the highest annual attendance rates of any tourist attraction in the world, estimated at 60 million. Tourism suffered as a result of a strong economic slowdown of the late-2000s recession, between the second half of 2008 and the end of 2009, and the outbreak of the H1N1 influenza virus, but slowly recovered. International tourism receipts (the travel item in the balance of payments) grew to US$1.03 trillion (€740 billion) in 2011, corresponding to an increase in real terms of 3.8% from 2010. International tourist arrivals surpassed the milestone of 1 billion tourists globally for the first time in 2012, emerging markets such as China, Russia, and Brazil had significantly increased their spending over the previous decade. The ITB Berlin is the world’s leading tourism trade fair. 1922 postcard of tourists in the High Tatras, Slovakia. 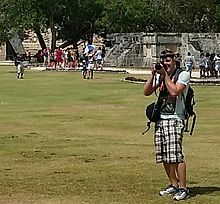 The word tourist was used in 1772 and tourism in 1811. It is formed from the word tour, which is derived from Old English turian, from Old French torner, from Latin tornare; ‘to turn on a lathe,’ which is itself from Ancient Greek tornos (τόρνος); ‘lathe’. Iguazu Falls in Misiones, Argentina. It is one of the most popular destinations in Latin America. Strandkorb chairs on Usedom Island, Germany. Not only does the service sector grow thanks to tourism, but also local manufacturers (like those producing the strandkorb), retailers, the real estate sector and the general image of a location can benefit. Drawa National Park in Poland, famous for its canoeing routes. Tourism brings in large amounts of income into a local economy in the form of payment for goods and services needed by tourists, accounting for 30% of the world’s trade of services, and 6% of overall exports of goods and services. It also creates opportunities for employment in the service sector of the economy associated with tourism. The service industries which benefit from tourism include transportation services, such as airlines, cruise ships, trains and taxicabs; hospitality services, such as accommodations, including hotels and resorts; and entertainment venues, such as amusement parks, restaurants, casinos, shopping malls, music venues, and theaters. This is in addition to goods bought by tourists, including souvenirs. In 1936, the League of Nations defined a foreign tourist as “someone traveling abroad for at least twenty-four hours”. Its successor, the United Nations, amended this definition in 1945, by including a maximum stay of six months. In 1941, Hunziker and Kraft defined tourism as “the sum of the phenomena and relationships arising from the travel and stay of non-residents, insofar as they do not lead to permanent residence and are not connected with any earning activity.”In 1976, the Tourism Society of England’s definition was: “Tourism is the temporary, short-term movement of people to destinations outside the places where they normally live and work and their activities during the stay at each destination. It includes movements for all purposes.” In 1981, the International Association of Scientific Experts in Tourism defined tourism in terms of particular activities chosen and undertaken outside the home. The terms tourism and travel are sometimes used interchangeably. In this context, travel has a similar definition to tourism, but implies a more purposeful journey. The terms tourism and tourist are sometimes used pejoratively, to imply a shallow interest in the cultures or locations visited. By contrast, traveler is often used as a sign of distinction. The sociology of tourism has studied the cultural values underpinning these distinctions and their implications for class relations. International tourist arrivals reached 1.035 billion in 2012, up from over 996 million in 2011, and 952 million in 2010. In 2011 and 2012, international travel demand continued to recover from the losses resulting from the late-2000s recession, where tourism suffered a strong slowdown from the second half of 2008 through the end of 2009. After a 5% increase in the first half of 2008, growth in international tourist arrivals moved into negative territory in the second half of 2008, and ended up only 2% for the year, compared to a 7% increase in 2007. The negative trend intensified during 2009, exacerbated in some countries due to the outbreak of the H1N1 influenza virus, resulting in a worldwide decline of 4.2% in 2009 to 880 million international tourists arrivals, and a 5.7% decline in international tourism receipts. The World Tourism Organization reports the following ten destinations as the most visited in terms of the number of international travelers in 2016. The World Tourism Organization reports the following countries as the ten biggest spenders on international tourism for the year 2015. Based upon air traffic, the MasterCard Global Destination Cities Index rates the following as the world’s ten most popular cities for international tourism. MasterCard rates the following cities as the world’s ten biggest earners from international tourism in 2015. Travel outside a person’s local area for leisure was largely confined to wealthy classes, who at times traveled to distant parts of the world, to see great buildings and works of art, learn new languages, experience new cultures, and to taste different cuisines. As early as Shulgi, however, kings praised themselves for protecting roads and building way stations for travelers. Travelling for pleasure can be seen in Egypt as early on as 1500 B.C. During the Roman Republic, spas and coastal resorts such as Baiae were popular among the rich. Pausanias wrote his Description of Greece in the 2nd century AD. In ancient China, nobles sometimes made a point of visiting Mount Tai and, on occasion, all five Sacred Mountains. By the Middle Ages, Christianity, Buddhism, and Islam all had traditions of pilgrimagethat motivated even the lower classes to undertake distant journeys for health or spiritual improvement, seeing the sights along the way. The Islamic hajj is still central to its faith and Chaucer‘s Canterbury Tales and Wu Cheng’en‘s Journey to the Westremain classics of English and Chinese literature. 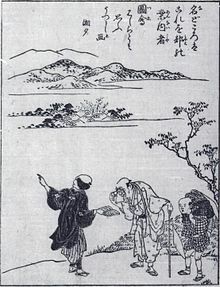 The 10th- to 13th-century Song dynasty also saw secular travel writers such as Su Shi (11th century) and Fan Chengda (12th century) become popular in China. Under the Ming, Xu Xiake continued the practice. In medieval Italy, Francesco Petrarchalso wrote an allegorical account of his 1336 ascent of Mount Ventoux that praised the act of traveling and criticized frigida incuriositas (“cold lack of curiosity”). The Burgundian poet Michault Taillevent (fr) later composed his own horrified recollections of a 1430 trip through the Jura Mountains. Prince Ladislaus Sigismund of Poland visiting Gallery of Cornelis van der Geest in Brussels in 1624. Modern tourism can be traced to what was known as the Grand Tour, which was a traditional trip around Europe (especially Germany and Italy), undertaken by mainly upper-class European young men of means, mainly from Western and Northern European countries. In 1624, young Prince of Poland, Ladislaus Sigismund Vasa, the eldest son and heir of Sigismund III, embarked for a journey across Europe, as was in custom among Polish nobility. He travelled through territories of today’s Germany, Belgium, Netherlands, where he admired the Siege of Breda by Spanish forces, France, Switzerland to Italy, Austria, and the Czech Republic. It was an educational journey and one of the outcomes was introduction of Italian opera in the Polish–Lithuanian Commonwealth. The custom flourished from about 1660 until the advent of large-scale rail transit in the 1840s, and generally followed a standard itinerary. It was an educational opportunity and rite of passage. Though primarily associated with the British nobilityand wealthy landed gentry, similar trips were made by wealthy young men of Protestant Northern European nations on the Continent, and from the second half of the 18th century some South American, US, and other overseas youth joined in. The tradition was extended to include more of the middle class after rail and steamship travel made the journey easier, and Thomas Cook made the “Cook’s Tour” a byword. The Grand Tour became a real status symbol for upper class students in the 18th and 19th centuries. In this period, Johann Joachim Winckelmann’s theories about the supremacy of classic culture became very popular and appreciated in the European academic world. Artists, writers and travellers (such as Goethe) affirmed the supremacy of classic art of which Italy, France and Greece provide excellent examples. For these reasons, the Grand Tour’s main destinations were to those centres, where upper-class students could find rare examples of classic art and history. —  Gross, Matt., Lessons From the Frugal Grand Tour.” New York Times 5 September 2008. The primary value of the Grand Tour, it was believed, laid in the exposure both to the cultural legacy of classical antiquity and the Renaissance, and to the aristocratic and fashionably polite society of the European continent. Leisure travel was associated with the Industrial Revolution in the United Kingdom – the first European country to promote leisure time to the increasing industrial population. Initially, this applied to the owners of the machinery of production, the economic oligarchy, factory owners and traders. These comprised the new middle class. Cox & Kings was the first official travel company to be formed in 1758. The British origin of this new industry is reflected in many place names. In Nice, France, one of the first and best-established holiday resorts on the French Riviera, the long esplanade along the seafront is known to this day as the Promenade des Anglais; in many other historic resorts in continental Europe, old, well-established palace hotels have names like the Hotel Bristol, Hotel Carlton, or Hotel Majestic – reflecting the dominance of English customers. 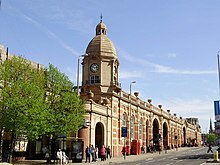 Leicester railway station – built in 1894 to replace, largely on the same site, Campbell Street station, the origin for many of Cook’s early tours. A pioneer of the travel agency business, Thomas Cook‘s idea to offer excursions came to him while waiting for the stagecoach on the London Road at Kibworth. With the opening of the extended Midland Counties Railway, he arranged to take a group of 540 temperance campaigners from LeicesterCampbell Street station to a rally in Loughborough, eleven miles (18 km) away. On 5 July 1841, Thomas Cook arranged for the rail company to charge one shilling per person; this included rail tickets and food for the journey. Cook was paid a share of the fares charged to the passengers, as the railway tickets, being legal contracts between company and passenger, could not have been issued at his own price. [clarification needed] This was the first privately chartered excursion train to be advertised to the general public; Cook himself acknowledged that there had been previous, unadvertised, private excursion trains.During the following three summers he planned and conducted outings for temperance societies and Sunday school children. In 1844 the Midland Counties Railway Company agreed to make a permanent arrangement with him, provided he found the passengers. This success led him to start his own business running rail excursions for pleasure, taking a percentage of the railway fares. In 1855, he planned his first excursion abroad, when he took a group from Leicester to Calais to coincide with the Paris Exhibition. The following year he started his “grand circular tours” of Europe. During the 1860s he took parties to Switzerland, Italy, Egypt and the United States. Cook established “inclusive independent travel”, whereby the traveller went independently but his agency charged for travel, food and accommodation for a fixed period over any chosen route. Such was his success that the Scottish railway companies withdrew their support between 1862 and 1863 to try the excursion business for themselves. Cruising is a popular form of water tourism. Leisure cruise ships were introduced by the Peninsular & Oriental Steam Navigation Company (P&O) in 1844, sailing from Southampton to destinations such as Gibraltar, Malta and Athens. In 1891, German businessman Albert Ballin sailed the ship Augusta Victoria from Hamburg into the Mediterranean Sea. In 1900, one of the first purpose-built cruise ships was Prinzessin Victoria Luise, built in Hamburg. Many leisure-oriented tourists travel to seaside resorts on their nearest coast or further afield. Coastal areas in the tropics are popular in both summer and winter. St. Moritz, Switzerland became the cradle of the developing winter tourism in the 1860s: hotel manager Johannes Badrutt invited some summer guests from England to return in the winter to see the snowy landscape, thereby inaugurating a popular trend. It was, however, only in the 1970s when winter tourism took over the lead from summer tourism in many of the Swiss ski resorts. Even in winter, up to one third of all guests (depending on the location) consist of non-skiers. Major ski resorts are located mostly in the various European countries (e.g. Andorra, Austria, Bulgaria, Bosnia-Herzegovina, Croatia, Czech Republic, Cyprus, Finland, France, Germany, Greece, Iceland, Italy, Norway, Latvia, Lithuania, Poland, Romania, Serbia, Sweden, Slovakia, Slovenia, Spain, Switzerland, Turkey), Canada, the United States (e.g. Montana, Utah, Colorado, California, Wyoming, Vermont, New Hampshire, New York) Lebanon, New Zealand, Japan, South Korea, Chile, and Argentina. Academics have defined mass tourism as travel by groups on pre-scheduled tours, usually under the organization of tourism professionals. This form of tourism developed during the second half of the 19th century in the United Kingdom and was pioneered by Thomas Cook. Cook took advantage of Europe’s rapidly expanding railway network and established a company that offered affordable day trip excursions to the masses, in addition to longer holidays to Continental Europe, India, Asia and the Western Hemisphere which attracted wealthier customers. By the 1890s over 20,000 tourists per year used Thomas Cook & Son. The relationship between tourism companies, transportation operators and hotels is a central feature of mass tourism. Cook was able to offer prices that were below the publicly advertised price because his company purchased large numbers of tickets from railroads. One contemporary form of mass tourism, package tourism, still incorporates the partnership between these three groups. Travel developed during the early 20th century and was facilitated by the development of the automobiles and later by airplanes. Improvements in transport allowed many people to travel quickly to places of leisure interest, so that more people could begin to enjoy the benefits of leisure time. In Continental Europe, early seaside resorts included: Heiligendamm, founded in 1793 at the Baltic Sea, being the first seaside resort; Ostend, popularised by the people of Brussels; Boulogne-sur-Mer and Deauville for the Parisians; Taormina in Sicily. In the United States, the first seaside resorts in the European style were at Atlantic City, New Jersey and Long Island, New York. By the mid-20th century the Mediterranean Coast became the principal mass tourism destination. 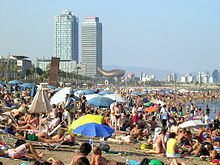 The 1960s and 1970s saw mass tourism play a major role in the Spanish economic “miracle”. 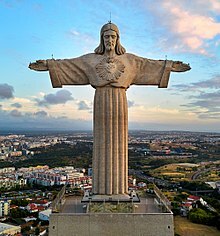 The Sanctuary of Christ the King, in Almada, has become one of the most religious tourism visited places. Other terms used for niche or specialty travel forms include the term “destination” in the descriptions, such as destination weddings, and terms such as location vacation. 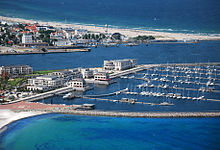 A destination hotel in Germany: Yacht Harbour Residence in Rostock, Mecklenburg. Nazaré, Portugal, is now listed on the Guinness World Records for the biggest waves ever surfed and has become a worldwide tourist attraction. There has been an up-trend in tourism over the last few decades,[vague] especially in Europe, where international travel for short breaks is common. Tourists have a wide range of budgets and tastes, and a wide variety of resorts and hotels have developed to cater for them. For example, some people prefer simple beach vacations, while others want more specialised holidays, quieter resorts, family-oriented holidays, or niche market-targeted destination hotels. The developments in technology and transport infrastructure, such as jumbo jets, low-cost airlines, and more accessible airports have made many types of tourism more affordable. The WHO estimated in 2009 that there are around half a million people on board aircraft at any given time. There have also been changes in lifestyle, for example some retirement-age people sustain year round tourism. This is facilitated by internet sales of tourist services. Some sites have now started to offer dynamic packaging, in which an inclusive price is quoted for a tailor-made package requested by the customer upon impulse. There have been a few setbacks in tourism, such as the September 11 attacks and terrorist threats to tourist destinations, such as in Bali and several European cities. Also, on 26 December 2004, a tsunami, caused by the 2004 Indian Ocean earthquake, hit the Asian countries on the Indian Ocean, including the Maldives. Thousands of lives were lost including many tourists. This, together with the vast clean-up operations, stopped or severely hampered tourism in the area for a time. Individual low-price or even zero-price overnight stays have become more popular in the 2000s, especially with a strong growth in the hostel market and services like CouchSurfing and airbnb being established. There has also been examples of jurisdictions wherein a significant portion of GDP is being spent on altering the primary sources of revenue towards tourism, as has occurred for instance in Dubai. Sustainable tourism can be seen as having regard to ecological and social-cultural carrying capacities and includes involving the community of the destination in tourism development planning (that was done e.g. 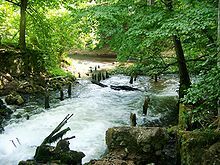 in Fruška Gora National Park in Serbia). It also involves integrating tourism to match current economic and growth policies so as to mitigate some of the negative economic and social impacts of ‘mass tourism‘. Murphy (1985) advocates the use of an ‘ecological approach’, to consider both ‘plants’ and ‘people’ when implementing the sustainable tourism development process. This is in contrast to the ‘boosterism‘ and ‘economic‘ approaches to tourism planning, neither of which consider the detrimental ecological or sociological impacts of tourism development to a destination. However, Butler questions the exposition of the term ‘sustainable’ in the context of tourism, citing its ambiguity and stating that “the emerging sustainable development philosophy of the 1990s can be viewed as an extension of the broader realization that a preoccupation with economic growth without regard to its social and environmental consequences is self-defeating in the long term.” Thus ‘sustainable tourism development’ is seldom considered as an autonomous function of economic regeneration as separate from general economic growth. Ecotourism, also known as ecological tourism, is responsible travel to fragile, pristine, and usually protected areas that strives to be low-impact and (often) small-scale. It helps educate the traveler; provides funds for conservation; directly benefits the economic development and political empowerment of local communities; and fosters respect for different cultures and for human rights.Take only memories and leave only footprints is a very common slogan in protected areas. Tourist destinations are shifting to low carbon emissions following the trend of visitors more focused in being environmentally responsible adopting a sustainable behavior. Volunteer tourism (or voluntourism) is growing as a largely Western phenomenon, with volunteers travelling to aid those less fortunate than themselves in order to counter global inequalities. Wearing (2001) defines volunteer tourism as applying “to those tourists who, for various reasons, volunteer in an organised way to undertake holidays that might involve aiding or alleviating the material poverty of some groups in society”. VSO was founded in the UK in 1958 and the US Peace Corps was subsequently founded in 1960. These were the first large scale voluntary sending organisations, initially arising to modernise less economically developed countries, which it was hoped would curb the influence of communism. This form of tourism is largely praised for its more sustainable approach to travel, with tourists attempting to assimilate into local cultures, and avoiding the criticisms of consumptive and exploitative mass tourism. However, increasingly voluntourism is being criticised by scholars who suggest it may have negative effects as it begins to undermine local labour, and force unwilling host communities to adopt Western initiatives, while host communities without a strong heritage fail to retain volunteers who become dissatisfied with experiences and volunteer shortages persist. Increasingly organisations such as VSO have been concerned with community-centric volunteer programmes where power to control the future of the community is in the hands of local people. Pro-poor tourism, which seeks to help the poorest people in developing countries, has been receiving increasing attention by those involved in development; the issue has been addressed through small-scale projects in local communities and through attempts by Ministries of Tourism to attract large numbers of tourists. 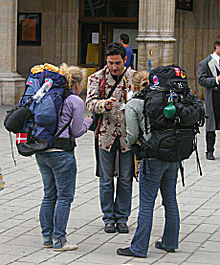 Research by the Overseas Development Institute suggests that neither is the best way to encourage tourists’ money to reach the poorest as only 25% or less (far less in some cases) ever reaches the poor; successful examples of money reaching the poor include mountain-climbing in Tanzania and cultural tourism in Luang Prabang, Laos. There is also the possibility of pro-poor tourism principles being adopted in centre sites of regeneration in the developed world. Recession tourism is a travel trend which evolved by way of the world economic crisis. Recession tourism is defined by low-cost and high-value experiences taking place of once-popular generic retreats. Various recession tourism hotspots have seen business boom during the recession thanks to comparatively low costs of living and a slow world job market suggesting travelers are elongating trips where their money travels further. This concept is not widely used in tourism research. It is related to the short-lived phenomenon that is more widely known as staycation. When there is a significant price difference between countries for a given medical procedure, particularly in Southeast Asia, India, Eastern Europe, Cuba and Canada where there are different regulatory regimes, in relation to particular medical procedures (e.g. dentistry), traveling to take advantage of the price or regulatory differences is often referred to as “medical tourism”. Educational tourism is developed because of the growing popularity of teaching and learning of knowledge and the enhancing of technical competency outside of classroom environment. In educational tourism, the main focus of the tour or leisure activity includes visiting another country to learn about the culture, study tours, or to work and apply skills learned inside the classroom in a different environment, such as in the International Practicum Training Program. 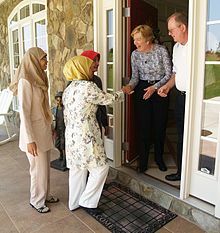 Friendship Force visitors from Indonesia meet their hosts in Hartwell, Georgia, USA. Creative tourism has existed as a form of cultural tourism, since the early beginnings of tourism itself. Its European roots date back to the time of the Grand Tour, which saw the sons of aristocratic families traveling for the purpose of mostly interactive, educational experiences. More recently, creative tourism has been given its own name by Crispin Raymond and Greg Richards, who as members of the Association for Tourism and Leisure Education (ATLAS), have directed a number of projects for the European Commission, including cultural and crafts tourism, known as sustainable tourism. They have defined “creative tourism” as tourism related to the active participation of travellers in the culture of the host community, through interactive workshops and informal learning experiences. More recently, creative tourism has gained popularity as a form of cultural tourism, drawing on active participation by travelers in the culture of the host communities they visit. Several countries offer examples of this type of tourism development, including the United Kingdom, Austria, France, the Bahamas, Jamaica, Spain, Italy and New Zealand. The growing interest of tourists in this new way to discover a culture regards particularly the operators and branding managers, attentive to the possibility of attracting a quality tourism, highlighting the intangible heritage (craft workshops, cooking classes, etc.) and optimizing the use of existing infrastructure (for example, through the rent of halls and auditorium). Experiential travel (or “immersion travel”) is one of the major market trends in the modern tourism industry. It is an approach to travelling which focuses on experiencing a country, city or particular place by connecting to its history, people, food and culture. The term “Experiential travel” is already mentioned in publications from 1985 – however it was discovered as a meaningful market trend much later. The Skull Chapel in south-western Poland is an example of dark tourism. Its interior walls, ceiling and foundations are adorned by human remains. It is the only such monument in Poland, and one of six in Europe. One emerging area of special interest has been identified by Lennon and Foley (2000) as “dark” tourism. This type of tourism involves visits to “dark” sites, such as battlegrounds, scenes of horrific crimes or acts of genocide, for example concentration camps. Dark tourism remains a small niche market, driven by varied motivations, such as mourning, remembrance, education, macabre curiosity or even entertainment. Its origins are rooted in fairgrounds and medieval fairs. Philip Stone argues that dark tourism is a way of imagining one’s own death through the real death of others. Erik H Cohen introduces the term “populo sites” to evidence the educational character of dark tourism. Populo sites transmit the story of victimized people to visitors. Based on a study at Yad Vashem, the Shoah (Holocaust) memorial museum in Jerusalem, a new term—in populo—is proposed to describe dark tourism sites at a spiritual and population center of the people to whom a tragedy befell. Learning about the Shoah in Jerusalem offers an encounter with the subject which is different from visits to sites in Europe, but equally authentic. It is argued that a dichotomy between “authentic” sites at the location of a tragedy and “created” sites elsewhere is insufficient. Participants’ evaluations of seminars for European teachers at Yad Vashem indicate that the location is an important aspect of a meaningful encounter with the subject. Implications for other cases of dark tourism at in populo locations are discussed. In this vein, Peter Tarlow defines dark tourism as the tendency to visit the scenes of tragedies or historically noteworthy deaths, which continue to impact our lives. This issue cannot be understood without the figure of trauma. Social tourism is making tourism available to poor people who otherwise could not afford to travel for their education or recreation. It includes youth hostels and low-priced holiday accommodation run by church and voluntary organisations, trade unions, or in Communist times publicly owned enterprises. In May 1959, at the second Congress of Social Tourism in Austria, Walter Hunziker proposed the following definition: “Social tourism is a type of tourism practiced by low income groups, and which is rendered possible and facilitated by entirely separate and therefore easily recognizable services”. Also known as “Tourism of Doom,” or “Last Chance Tourism” this emerging trend involves traveling to places that are environmentally or otherwise threatened (such as the ice caps of Mount Kilimanjaro, the melting glaciers of Patagonia, or the coral of the Great Barrier Reef) before it is too late. Identified by travel trade magazine Travel Age West editor-in-chief Kenneth Shapiro in 2007 and later explored in The New York Times, this type of tourism is believed to be on the rise. Some see the trend as related to sustainable tourism or ecotourism due to the fact that a number of these tourist destinations are considered threatened by environmental factors such as global warming, overpopulation or climate change. Others worry that travel to many of these threatened locations increases an individual’s carbon footprint and only hastens problems threatened locations are already facing. 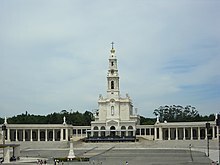 The Shrine of Our Lady of Fátima, in Portugal, is one of the largest religious tourism sites in the world. Religious tourism, in particular religious travel, is used to strengthen faith and show devotion both of which are central tenets of many major religions. Religious tourists seek destinations whose image encourages them to believe that they can strengthen the religious elements of their self-identity in a positive manner. Given this, the perceived image of a destination may be positively influenced by whether it conforms to the requirements of their religious self-identity or not. The World Tourism Organization (UNWTO) forecasts that international tourism will continue growing at the average annual rate of 4%. With the advent of e-commerce, tourism products have become one of the most traded items on the internet. Tourism products and services have been made available through intermediaries, although tourism providers (hotels, airlines, etc. ), including small-scale operators, can sell their services directly. This has put pressure on intermediaries from both on-line and traditional shops. 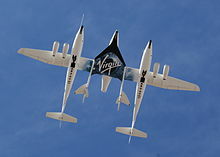 SpaceShipTwo is a major project in space tourism. There has been a limited amount of orbital space tourism, with only the Russian Space Agency providing transport to date. A 2010 report into space tourism anticipated that it could become a billion-dollar market by 2030. Tourism Police of Colombia at the Chicamocha National Park, Santander. The focus on sport and spreading knowledge on the subject, especially more so recently, led to the increase in the sport tourism. Most notably, the international event such as the Olympics caused a shift in focus in the audience who now realize the variety of sports that exist in the world. In the United States, one of the most popular sports that usually are focused on was Football. This popularity was increased through major events like the World Cups. In Asian countries, the numerous football events also increased the popularity of football. But, it was the Olympics that brought together the different sports that led to the increase in sport tourism. The drastic interest increase in sports in general and not just one sport caught the attention of travel companies, who then began to sell flights in packages. Due to the low number of people who actually purchase these packages than predicted, the cost of these packages plummeted initially. As the number start to rise slightly the packages increased to regain the lost profits. With the certain economic state, the number of purchases decreased once again. The fluctuation in the number of packages sold was solely dependent on the economic situation, therefore, most travel companies were forced to set aside the plan to execute the marketing of any new package features. As a result of the late-2000s recession, international arrivals suffered a strong slowdown beginning in June 2008. Growth from 2007 to 2008 was only 3.7% during the first eight months of 2008. This slowdown on international tourism demand was also reflected in the air transport industry, with a negative growth in September 2008 and a 3.3% growth in passenger traffic through September. The hotel industry also reported a slowdown, with room occupancy declining. In 2009 worldwide tourism arrivals decreased by 3.8%. By the first quarter of 2009, real travel demand in the United States had fallen 6% over six quarters. While this is considerably milder than what occurred after the 9/11 attacks, the decline was at twice the rate as real GDP has fallen. However, evidence suggests that tourism as a global phenomenon shows no signs of substantially abating in the long term. It has been suggested that travel is necessary in order to maintain relationships, as social life is increasingly networked and conducted at a distance. For many people vacations and travel are increasingly being viewed as a necessity rather than a luxury, and this is reflected in tourist numbers recovering some 6.6% globally over 2009, with growth up to 8% in emerging economies.